The ministry of Defence has signed a letter of intent to acquire 18 Hawk jets for training purposes. The jets are at the moment owned by the Swiss Air Force. The procurement also includes spares, gear for maintenance and other equipment as well. The military has calculated that the planes would last at least 15 years in service, because only 17 % of the jets overall flight time has been used by the Swiss Air Force. The price of the purchase is the same as it would be for two new similar jets. With this purchase the renewal of the Hawk fleet can be extended by approximately 10 years until 2025-2027. Finland boosts its Hawk fleet by purchasing eighteen second-hand BAE Systems Hawk 66 jet trainers with maintenance tools and spares from Switzerland. The purchase was announced by the Minister of Defence Jyri Hakamies earlier today. The value of the contract is approximately 40 million euros, which equals the price of two new Hawk-category trainers. The Finnish Air Force’s current Hawks will reach the end of their lifespan between 2017 and 2019. The Swiss airframes have flown less than one fifth of their maximum flight hours, which translates into 90,000 flight hours remaining, which in turn equals fifteen years of operation in Finnish Air Force service. The same number of flight hours could be attained by nine new Hawk-category aircraft. The purchase now finalized allows the service more time to plan its future flight training arrangements and enables cooperation in this field with other European air forces. 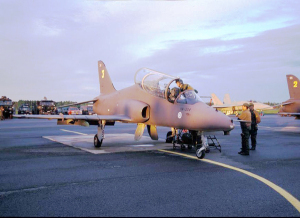 Finland placed an order for fifty Hawk 51s as early as 1977, the first aircraft being handed over in 1980. 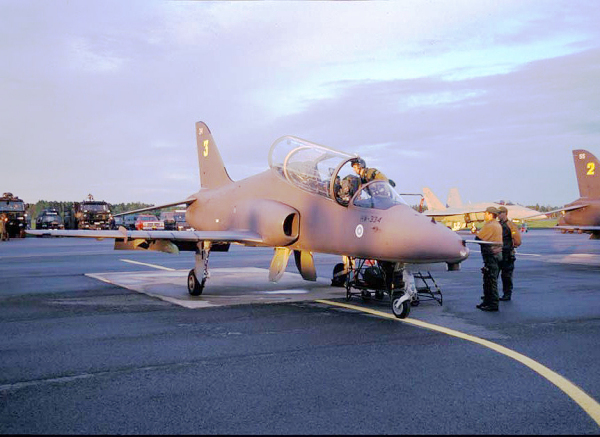 In 1990 the Finnish Air Force acquired seven Hawk 51As as attrition replacement. The service has forty-nine Hawks, which have undergone an extensive structural life-extension modification in Finland. An upgrade project in cooperation with the defense systems provider Patria is currently in its initial phases. Hawk training in the Finnish Air Force is consolidated in the Training Air Wing in Kauhava. Switzerland bought twenty Hawks in 1992. Compared with Finnish aircraft, they have minor differences primarily in the power plant, avionics, and weapon system. Since the aircraft saw only limited use in Switzerland the Swiss put eighteen aircraft up for sale in 2002.